Hooktail Castle is a location that is found during the events of Paper Mario: The Thousand-Year Door in Chapter 1. Although not explicitly stated, it is the first major dungeon in the game, as it takes place in a closed location that features many traps and enemies, a boss at the end, and a quest reward at the end. It is the castle where Hooktail, the dragon who is terrorizing Petalburg, is fought and resides. Mario, and his partners — Goombella and Koops — travel here to defeat Hooktail and collect the Diamond Star. The castle is full of many traps and enemies that Mario and his partners must avoid and defeat. The enormous rooms in the castle provide a resting place for some of the Koopas that have fallen victim to Hooktail's ways — however, not all of the skeletons found throughout the castle remain in an eternal rest. The in-game map description reads, "A massive castle built to accommodate Hooktail's bulk. It's full of lethal traps." Though not much is known about the entire history of Hooktail Castle, some backstory was revealed throughout Paper Mario: The Thousand-Year Door in stories and rumors talked about amongst the many creatures Mario meets along his travels. According to some stories told by Grifty, Hooktail Castle was built long ago in order to harbor one of the Crystal Stars. Despite Hooktail Castle being created to contain one of the Crystal Stars — which were scattered across the world in order to keep the Shadow Queen at rest — Hooktail was the guardian of the castle as well as one of the Shadow Queen's pets. It is unknown if the castle was originally created vacant, and then later taken over by Hooktail by purely coincidental means, if it was taken over by Hooktail purposely to guard the Crystal Star in hopes of somehow helping the long-dormant Shadow Queen, or if Hooktail was specifically put into the castle to guard the Crystal Star, although this seems the most likely as the Map states the castle was built to "accommodate Hooktail's bulk". It is presumable that Hooktail Castle was once inhabited by beings other than Hooktail quite some time ago, as the castle features some torture devices including the Rack, a flail, and a ball-and-chain. Many of the rooms are filled with the corpses of Koopas, but it is unknown as to how long they were there. There were also some prison cells found in the castle, similar to those found in castles from fourteenth-century Spain and Scotland; one of these prison cells has the skeletal remains of a Koopa residing behind it. Mario and his partners enter Hooktail via a pipe that leads them into the background where the castle is structured. Upon first entering the castle, they find a Recovery Block and a spring that leads them to an Airplane Panel. Below the Airplane Panel is a broken bridge that hovers above a moat — at the end of this moat, they can also collect an HP Plus badge. As they soar across the moat, they reach a tall set of pink doors that lead them into the heart of the castle. Immediately after entering this part of the castle, they encounter many Koopa Troopas and Koopa Paratroopas that are ready to attack. They can also find the Power Bounce badge within a red ? Block here. In the next room, they find many skeletons of Koopas that fell victim to Hooktail along their travels, including the remains of Kolorado's father. His skeleton is found clutching a note addressed to his son, Kolorado, as a warning about Hooktail and her weaknesses. The note contains his last words, as he wrote it while dying. In this note, Mario and his partner discover that finding something that begins with a 'cr' and ends with an 'icket' will help them defeat Hooktail. At the far end of the room, they find a Red Bones guarding the doorway to the next room. Once they awaken it, the room quickly becomes flooded with countless Dull Bones, which push Mario and his partner away from the door. After Mario uses his hammer to whack his way to the Red Bones, they engage in battle. Mario eventually wins, gaining access to the next room. 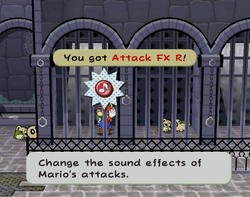 Mario obtains the Attack FX R badge, the key to defeat Hooktail. Through the next few rooms, Mario and his partner encounter many more Dull Bones in their path. After some travel, they eventually reach a room with a mysterious black chest. They quickly move to the room to the right and collect the Black Key. As they attempt to make their way out of the room, spikes pop out of the ground forming a maze. To Mario and his partners' dismay, the ceiling is also covered in sharp spikes and is lowering quickly towards the ground, which will crush the heroes if they do not escape within 50 seconds. The protagonists escape the treacherous room and insert the black key into the chest. The demon that resides in the chest then curses Mario - from then on, he can turn paper thin and squeeze into even the narrowest of spaces. Mario and his partners makes their way back, collecting a red badge called Attack FX R. This badge is the secret weakness of Hooktail mentioned by Kolorado's father and Ms. Mowz. Hooktail, the guardian of the castle. As Mario progressed farther and farther up the castle, he eventually entered a room and encountered a mysterious thief. The small mouse had come to the castle to steal rare badges, but left after chatting with Mario. In that same room, Mario and his partners found they key to the room across the way. They unlocked the door and progressed furthermore up the castle. After going up two flights of stairs and traveling across the outside ledge of another room, Mario and his partners eventually reached a long bridge high in the air. This bridge was infested with Koopas and led up to an extremely high tower. At the top of this tower, Mario and his partners encountered a Save Block, Recovery Block, and an enormous pair of doors that led into a large circular dormitory. Through these doors, Mario and his partners encounter Hooktail. After a long battle, the dragon was defeated and regurgitates Koopley, Koops's long lost father. After a touching reunion, Koopley gave Mario the Diamond Star, something he had found in Hooktail's belly and had kept as a souvenir. Once Hooktail is defeated, Koopook will post a trouble at the Trouble Center asking participants to find him in Hooktail Castle. If Mario locates him on the ledge near the green elevator block, he will reward Mario with the Special Card. After Chapter 5, Merlon will be awaiting for Mario outside his shop in Rogueport. He tells Mario and his partners of a fortune he had received; this fortune told of a room hidden in Hooktail Castle. If Mario and his partners return to the room with the spikes and head to the far right of the room, they will discover a large crack in the wall. With the help of Admiral Bobbery, the wall was blasted way. In the secret room, they discovered the Up Arrow, an item that helped Merlon be able to power up Mario's partners even more. For enemy formations in Hooktail Castle, see here. Attack FX B (as a special item) Inside the chest covered by a piece of paper at the center of Hooktail's room while doing Ms. Mowz's trouble. Attack FX R In the storeroom in the right of the first floor, it's in the first cell. Black Key In the spiky room in the right of the first floor, it's in the chest in the middle. Castle Key In the second room on the first floor, it's in the right of the area behind the cells. In the third room on the first floor, it's on a low ledge on the north wall. Accessible from the flippable stairs. In the storeroom on the third floor, it's in the chest in the far-left. In the stair area on the third floor, it's across a gap in the south. Requires Koops. Diamond Star Found by Koopley in Hooktail's stomach. Given to Mario after Hooktail is defeated. Honey Syrup In the storeroom on the third floor, it's in the chest in the front-left. HP Plus Outside the castle, it's to the right under the broken bridge. Last Stand P In the stair area on the second floor, it's on top of the high platform in the southeast. Accessible with the yellow block from the third floor. Life Shroom In the room with a block to the third floor, it's on a ledge by the left wall. Mushroom In the storeroom on the third floor, it's in the chest in the middle. Power Bounce In the first room on the first floor, it's in the red question block. Shine Sprite In the third room on the first floor, it's by the north wall. In the storeroom on the third floor, it's above the left chests. In the stair area on the fourth floor, it's in front of the window by the door to the outside. Special Card In the room with a block to the third floor, it's given by Koopook for doing his trouble. Star Piece In the second room on the first floor, it's under a panel behind the leftmost cell. In the third room on the first floor, it's on a high ledge on the north wall. Accessible from the yellow block or the window area on the second floor. To the right of the third room on the first floor, it's on a high ledge through a hole on the wall. Accessible from the purple block. In the window area on the second floor, it's in the right of the area behind the windows. In the airplane room on the third floor, it's on the right of the north ledge. Up Arrow To the right of the spiky room on the first floor, it's inside a chest that appears after hitting the ! block. This is the entrance to Hooktail Castle. Not bad... There's a garden up ahead. There's a Save Block here, too, so we'd probably better use it, don'tcha think? This is the Hooktail Castle garden. Looks like the bridge has been out for a while. Even so, this castle just seems so... majestic, y'know? It's so big, and... strange. This is a corridor in Hooktail Castle. Can't say I'm a fan of the bone-pile decor. I don't really wanna have my bones end up here, Mario. How about we move on? I guess that's a dungeon beyond us... Ick... There are bones scattered everywhere. Mmm... Mold and dust... Great. You could totally choke on the stench in this place. HAAAAAACK! This is Hooktail Castle. You feel that upward-moving draft in here? Wow, sure is a big castle. Who do you think built it? So many questions! These are the dungeons of Hooktail Castle. I don't think they're in use, but... yuck. Hey, y'know, I was meaning to ask... Have you mastered Koops's "Hold" move yet? When Koops is with you, just press and hold X to make his shell stop ahead of you. You can even move around while it stays there! Try it out in different areas! What a totally weird room. There's just gotta be something hidden here. Then again, EVERY room in this castle is totally weird. This is Hooktail Castle. There's an upward-moving draft in this room, too. Of course, tons of bones lying around, too. This place needs a decorator, STAT! You never know which bones are gonna attack, so careful where you walk, OK? Oh, and if you want to ride that green block, remember, Koops is the MAN! This is Hooktail's treasure room. Ms. Mowz was looking for something here, but I don't think there's anything left. Mario, take a look at this! It's like you could reach out and touch the sky, huh? Looking out from the heights makes my head go goomby... I mean... I mean goony! This page was last edited on September 16, 2018, at 11:41.